Thank you for visiting us. Kindly fill in the details below for us to help you with your enquiry. * All the fields marked in green asterisk are mandatory. While larger aspects like structure, colour tone, lines of design will drive the overall feel of an interior, it is the small artefacts that hold the allure to engage and unravel a story. Combining our sense of décor, feel for finesse and exposure to art and handcraft markets, we have meticulously curated a spectrum of artefacts and art applications. 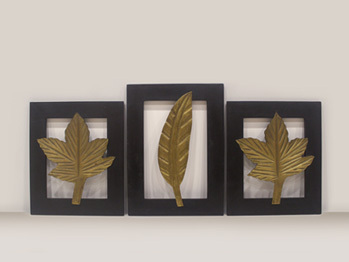 Choose from pieces made using diverse material like glass, wood, ceramic, metal, paper, clay and more. Visit us to discover creations of art that will let you unravel your unique story. 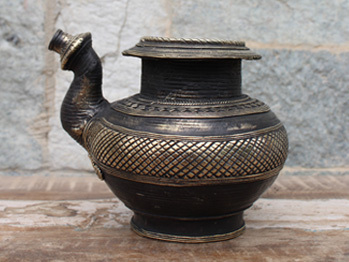 This antique finish kettle is made by an awardee from Orissa using lost wax casting. It takes you back to that era when brass utensils were used in homes and palaces. 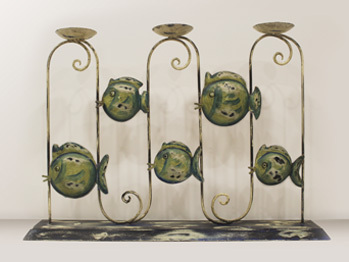 Hand crafted with wrought iron, this candle stand lights up in an essence of its own. The fishes spur a feel that is both timeless and surreal. 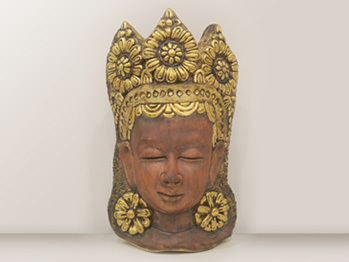 Tara is a 3 dimensional face sculpture handcrafted with ceramic. This piece has been created in collaboration with Down To Earth. These frames capture modernism in a simple but elegant manner in an unfailing combo of black and gold. This lamp takes retro design to a whole new level. 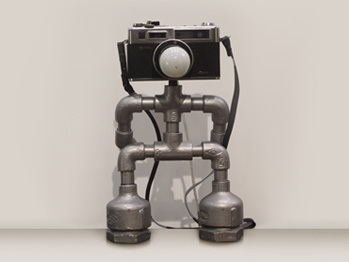 The pipes lend an industrial feel, while the camera adds a the vintage touch. 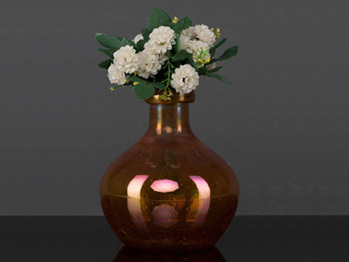 This orange coloured glass vase with its hi-sheen heightens the precious feel of quartz itself. 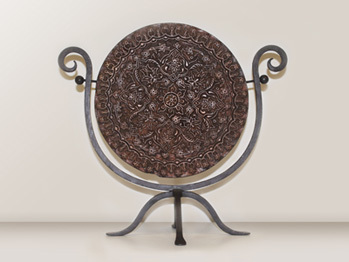 It is perfect for niches, console tables, coffee tables & desks. 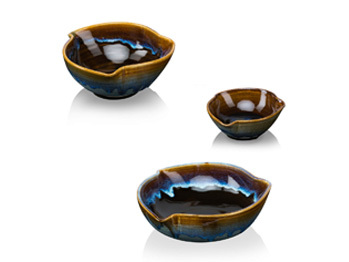 These bowl set is handcrafted kiln-fired shaded in earthy tones blended with colours of the ocean. Add delight to taste while serving soups, snacks and dips. Combine wood and cast iron well, and you have a winner! Make a bold statement with the block printed wooden seal table top. 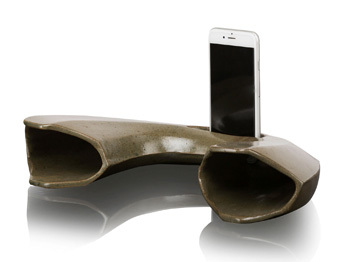 This eco-friendly kiln-fired sound dock lets you enjoy musical notes while mother nature hums with life. Place your phone in the slot and hear amplified tunes! Horses fly without wings and conquer without swords. 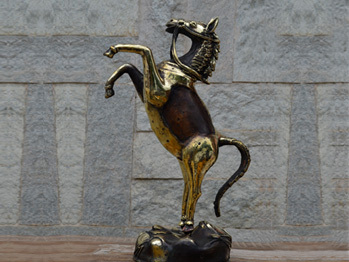 This brass artifact made from the age-old lost wax casting technique will energise any corner. 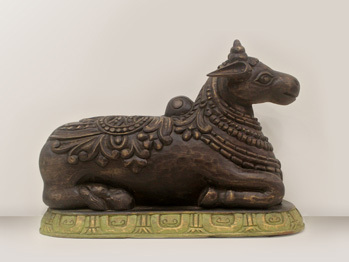 This beautifully carved wooden Nandi is perfect for a prayer room or even at at the entrance. Place it and let its aura flow. Grace is synonymous with swans. 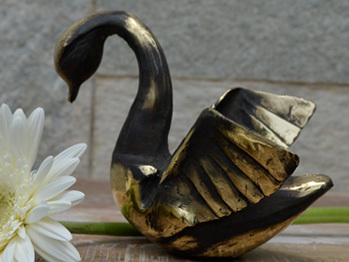 This swan made using the 5000-year old technique of lost wax casting has a distinct allure and will surely hold your gaze. 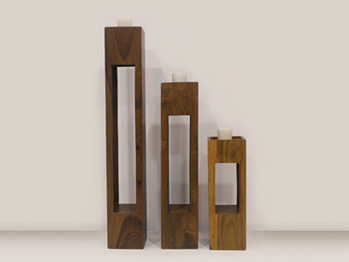 Add a touch of luxury with this set of candle stands to any room. 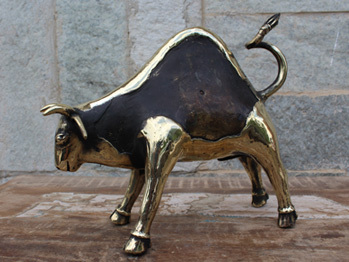 Bull has long been an important symbol in many cultures. This bull made using the age-old lost wax casting technique will add more power to any display. 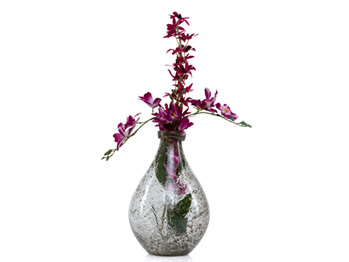 This transparent thick glass vase with the sand granules left during cooling bring in an interestingly raw yet beautiful texture. Great for niches, console tables, coffee tables & desks. 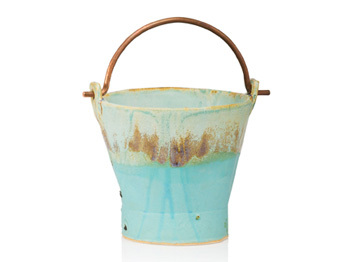 The sky Balti is a sky blue Kiln fired bucket. A quirky piece for keeping your treasures or pretty just as it is. Decorative and can be used as a Planter. A horse signifies strength and power. 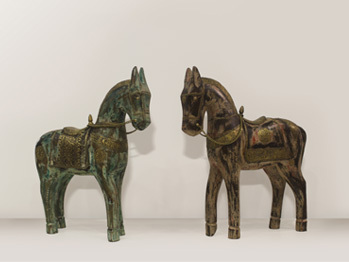 Place this pair of beautiful horses on your work desk or in your living room to keep the ambience charged up. 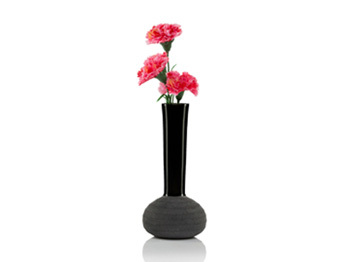 With its lower half sand blasted and a hi-gloss black funnel projecting, this black glass vase is a great play of duality. This piece is sure to adorn niches, console tables, coffee tables & desks. Are you an Artist? Explore Creatorscape.